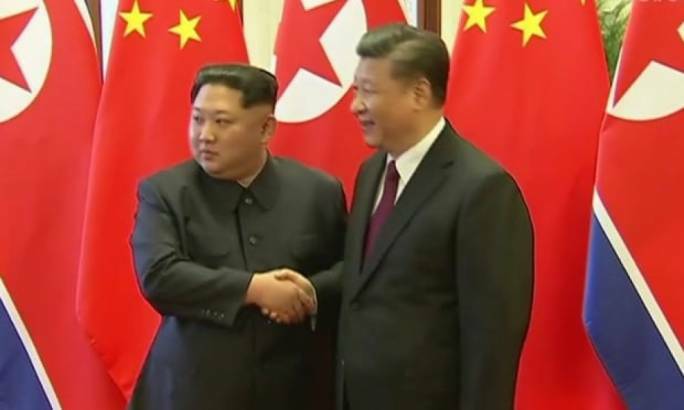 After days of speculation, China has confirmed that North Korean leader Kim Jong-un visited Beijing, where he met with Chinese president Xi Jinping, and pledged his commitment to denuclearising the Korean peninsula. The visit, confirmed by China and North Korea, was Kim's first known foreign trip since taking office in 2011. Kim held "successful talks" with Chinese leader Xi Jinping in Beijing, China's Xinhua news agency reported. Kim said that the issue of denuclearisation could be resolved if South Korea and the US “respond to our efforts with goodwill, create an atmosphere of peace and stability”. China is North Korea's main economic ally and it was thought highly likely it would consult Beijing before planned summits with South Korea and the US. Kim is due to meet South Korean President Moon Jae-in in April, and US President Donald Trump in May. The Beijing visit is considered a significant step in North Korea's preparation for the proposed talks. The White House said China had briefed the US on the visit on Tuesday and that Xi had sent Trump a personal message. “We see this development as further evidence that our campaign of maximum pressure is creating the appropriate atmosphere for dialogue with North Korea,” the White House said in a statement. Last month, Trump accepted an unprecedented invitation to meet Kim, after months of hostility and North Korean missile tests. If the summit goes ahead, Mr Trump would become the first sitting US President to meet a North Korean leader.